A couple of years ago I started following a great blog, 100daysofrealfood.com, looking for inspiration on healthy meals for the family. I have wanted to “go real food” for a long time, knowing too much to be comfortable with packaged foods and synthetic ingredients. We’ve been buying mostly all organic food, as we could find it, having committed to organic dairy and meat many years ago. But as you know, organic does not mean healthy, and we certainly were buying our fair share of organic junk food. And more. But then we made a decision, starting September 1st we’d give the real food thing a serious try. And we are loving it! The woman behind the 100daysofrealfood.com blog set out a number or “rules” that guide her family; and I agree with her assessment. No refined sugars, 100% whole grains only, no prepared foods with more than a few ingredients. We haven’t converted 100% yet, but we are on our way. The most major change for us is in the bread department. 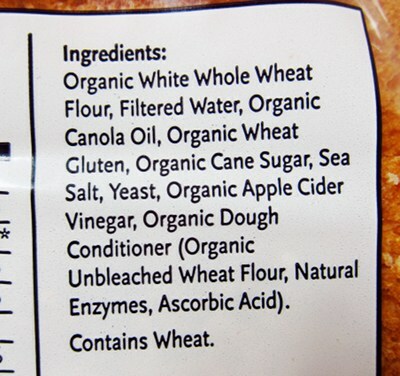 Before September, I would mostly buy organic, Whole Foods brand, whole wheat bread. Sounds good right? Until I started on this journey, I felt pretty good about this choice. But, I knew that with homemade the ingredient list would be shorter. So, we bought ourselves a low-end breadmaker (thank you Bed Bath & Beyond 20% off coupon) and got to work. Now I make about 2 loaves per week, and it is delicious. And it really only take 5 minutes tops to get all the ingredients (whole wheat flour, olive oil, sea salt, yeast, honey) in the breadmaker! We’ve already improved our slicing skills, so we don’t have thick pieces anymore. I use this recipe. I also have made homemade pizza crust (also whole wheat), dinner rolls (that we also sub for hamburger buns) and bagels. We plan to make homemade pasta soon. The other changes are more subtle. In packing the kids’ lunches, instead of sides of chips, they get fruit, or homemade whole wheat muffins. We also are converting away from canola oil and only using coconut and olive oils. And instead of refined sugar, we use maple syrup or honey. My recipes are still fabulous, and using these alternative oils and sweeteners have had no impact on taste! You may think I am in the kitchen all the time, but I’m not. However, this new lifestyle does demand more planning! And we can’t run out of fruit or else my kids would go hungry at snack time! My husband and I do a very detailed meal plan on Saturday or Sunday, even thinking through lunches. Then we do a huge shop (or 2, if we can hit the farmers market) to stock up. The interesting thing is that we are coming home with fewer groceries, since it is all raw materials. No more bulky boxes. Then I do a fair amount of cooking over the weekend — but really I’m making our regular meals at the same time, so its only an incremental increase in kitchen time. And knowing that we are set for the week makes it so worthwhile! This hasn’t gone down without a few hiccups. First, Kid #1 (10 1/2) is a super picky eater. Super. Picky. Eater. His diet includes 1. Mac N Cheese 2. Pizza 3. Cheeseburger 4. Tacos and 5. Nachos with cheese. He’ll eat an apple. And maybe some carrots. Don’t ever suggest he dip an apple in cheese, he thinks its gross. But, the same kid has been overheard in recent days to say “this real food thing isn’t so bad.” See, he likes my homemade mac n cheese. He also has surprisingly accepted zucchini muffins (knowing that they contained zucchini!) But, he has also been grumpy and has skipped a few meals out of protest. He does get to buy lunch once a week at school, and it is undoubtedly a cheese slathered affair. But I’m ok with it for now. We also would love to do all real food, but struggle with our allergy son. To be “real” would mean forgoing some staples that he eats as alternatives to dairy. So for now, we aren’t turning away from our beloved Daiya cheese alternative or Earth Balance margarine, or the soy products. But, we have stopped plying the boy with packaged junk! Middle child (8 1/2) has welcomed this lifestyle with excitement. He’s our good eater. Loves to try new foods. Craves veggies and fruit. Begs for chicken and ethnic food. His attitude has certainly made the transition easier! So, at the end of our first month of real food, I have to say that it has been easier than I thought, more rewarding, and the food has been all the better. I look forward to furthering our transition, learning more recipes and buying less packaged foods. Have you made any healthy food changes? Please share!